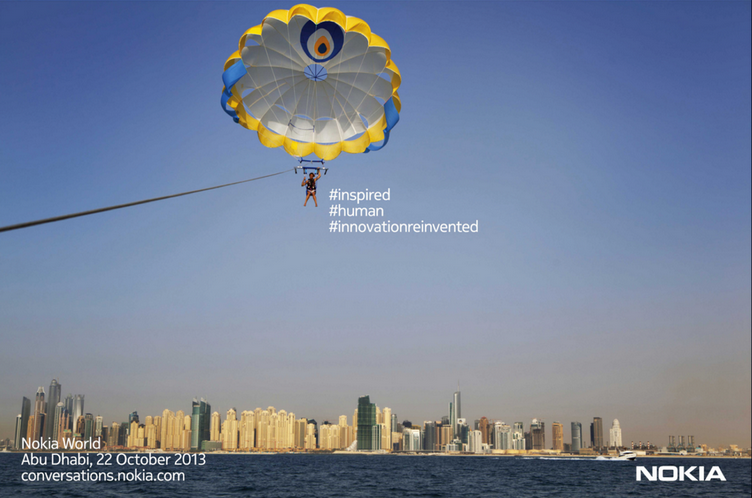 Nokia released another teaser for their October 22nd event in Abu Dhabi, UAE. Today Nokia has once again posted the teaser on their Nokia Twitter account about the event which is going to take place in Abu Dhabi on October 22nd 2013. In their first teaser there was nothing about the location of the event but yet it was confirmed that the event will take place on last week of October. This is the first time that a large mobile manufacturing company to hold their mega event in UAE’s city of Abu Dhabi. However there are man such events have been hosted by Dubai in recent history. The first teaser by Nokia was loaded with hash tags like #closer, #wayforward and #innivationrein event in their first tweet disclosing the whole story. But today Nokia did added the Location with the new images. We can expect that there will be some hints about the launch of new devices in their upcoming tweets about this mega Nokia event to take place in Abu Dhabi on October 22nd 2013. The tweets we have found sound more familiar as Nokia did posted before the official release of their gigantic Windows Camera phone, the Nokia Lumia 1020 with the huge 41-megapixel Camera lens which tends to be the best smartphone camera on the planet earth, may be Aliens may have got better megapixel cameras on their respective planets. If not than this will surely be the best camera phone in universe. Heading to the event the only device which is surely the most anticipated Nokia phone currently is the Nokia Lumia 1520, loaded with a giant 6-inch display. This will be the first “Galaxy Note” of the Windows Phone 8 and we expect to see more phablet phone in near future to be manufactured by Nokia. Beside this there are some rumors that Nokia is likely to see forward and grab a chunk of Tablets market by introducing the same designed tablets loaded with Windows 8. The idea will attract some new customers to the Nokia’s new line of Gadgets. New Hardware updates on Apple iMac, a short review.